When things start to get a little fall-like, I start baking. Well, first, obviously, I start panicking. Then I start baking. I actually like baking, and often wish I had more time for things like this. But I often wish I had more time for a lot of things (aka naps) so I take a Sunday morning here and there to do what I can. Last weekend I made one of my faves, homemade english muffins. So, so much better than anything you buy at the store. I don’t really keep any other kind of bread in the house, so these muffins are the vehicle with which I eat homemade raspberry jam, eggs, and–with some butter, garlic, and Parmesan cheese– as garlic toast to go with my tomato soup. I decided to make myself some of that garlic toast to go with my soup. I got the muffins layered with butter and slices of garlic from my garden, sprinkled them with Parmesan, and set them in the toaster oven to toast for 5 minutes. Then I realized the worst had happened… there was no soup. Then it occurred to me… why couldn’t I just eat my eggs on garlic toast? YOU GUYS. Why don’t we always eat eggs on garlic toast? Why isn’t this a thing? 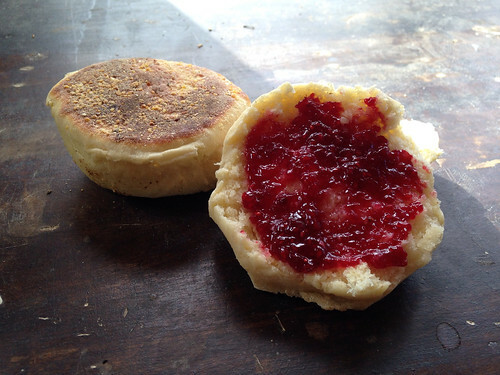 I use this recipe(ish) for english muffins. 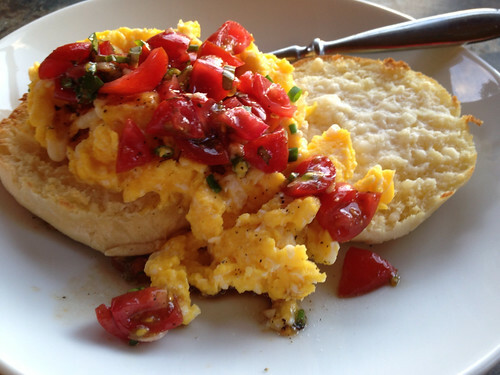 I use a similar recipe to this video for scrambled eggs. Then, since I was waiting for the toast to toast, I chopped up some cherry tomatoes, more garlic, chives, basil, and parsley from the garden, and mixed it with a little olive oil and balsamic to top off the eggs. This is, by far, the most delicious thing that has ever been made from all the stuff I have on hand between the chickens and the garden. EGGS ON GARLIC TOAST, guys. I don’t even care what else you put on it… that’s the key. Creativeness is how the ” next big things ” are discovered. It sounds really yum yum, healthy, made with all Black Feather Farm raised ingredients. I think you’ve got yourself a hit Kit, that would be a compliment to any menu. Fresh out of the oven muffins sound yummy as well. 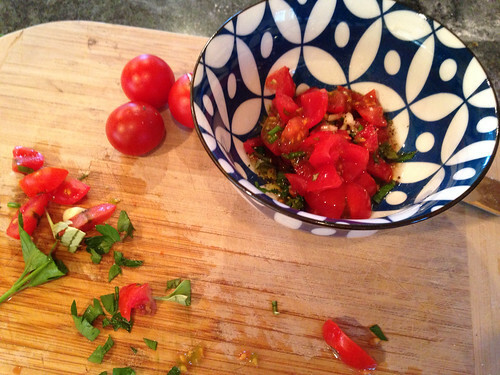 Tomatoes always look so much better out of the home garden, don’t you think? That does look like the most delicious egg recipe ever! Looks like it will fill you up within a couple of minutes. YUMMY! Yeah, I’m super into this idea. My favorite egg dish is black beans + sauteed zucchini + salsa verde with a fried egg on top and some cilantro. NOM. Thanks so much for the recipes. I’ll be baking this weekend! I don’t think you can ever go wrong with garlic! I’ve been making those eggs somewhat for months. They are the best. I wasn’t really a fan of scrambled much before finding them.